You spend some of your hard earned money on learning a new language online. It’s really the best and easiest way for your busy schedule. You get to take classes when you want, talk about what you want, and have the ability to speak to whom ever you want. It really doesn’t get any better. Speaking to a native speaker of the language you are learning is the greatest way to learn the language but are you really using all of your time wisely? Everyday you have some down time, whether it’s the last 15 minutes of your lunch break, your 45 minute train ride to work, or even just sitting on the couch being lazy. While it is most certainly wise to rest yourself and your brain, I am sure there is something constructive you can do during those times as well. Do you see where I’m going here? Continue learning your language of course! There are tons of ways to use your time more wisely that is constructive and beneficial to your learning goals. Why not put your brain to work a bit more when you are on the train to work or waiting at the bus stop? Get that smart phone out and stop using it to check your Facebook or Twitter account, and instead use it to brush up on your language skills. There are tons of cool apps where you can practice what you know, learn new vocabulary, and even speak to test your pronunciation! This is an awesome way to use your time. When you come across something you don’t understand, you are unsure of, or you need more clarification on, just make a note for yourself and ask your teacher in your next lesson. So which apps are the most recommended? Babbel is a popular app that conveniently categorizes subjects for you to choose from and learn vocabulary related to that particular topic. There is a talking option to correct your pronunciation, and then there are review sessions to see if everything sunk in. The following languages are offered on this app: French, Spanish, Italian, German, Swedish, Brazilian Portuguese, English, Dutch, Polish, Indonesian and Turkish. This language learning app is more like a game. You receive points when you are correct and “lose lives” if you get things wrong. They test you on all aspects, and the app orders these things randomly so there is no room for getting too comfortable with the format or getting bored. The languages offered are: Spanish, German, French, Portuguese, or Italian. This is more of a vocabulary matching app with tons of phrases and words to be learned in the beginning. However as you advance, the levels get harder requiring you write and answer questions. These answers are then graded and checked by people who speak the language. The languages offered are: English, Spanish, German, French, Italian, Portuguese (Brazilian), Russian, Polish, Turkish, Arabic, Japanese, Chinese. This is an award winning language school online. So it is pretty much an app with a real person at the other end. It is strongly recommended for any serious language learning since even with todays modern apps there is really no substitute for a real teacher when learning another langauge. The best part about all of these apps are that they are free to download on your phone. Eventually, after mastering these apps, there might be a few you can pay to get to the advanced level course which you can choose to do or not. 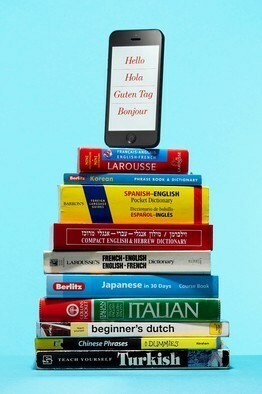 However with these apps, it makes your language learning journey that much easier. No more wasted time at the doctors waiting room or boring Sunday afternoons. After playing with these apps, you will be spitting out the language more fluently and totally impressing your teacher. Don’t forget to ask your teacher if you have any questions that arise while you are playing these apps.